Scientists with the U.S. Geological Survey sample water in Goodwater Creek, Mo., for pesticides and other chemicals that may have run off from the surrounding land. Research teams are monitoring 100 streams in the Midwest this summer. America's hugely productive food system is one of its success stories. The nation will export a projected $139.5 billion in agricultural products this fiscal year alone. It's an industry that supports "more than 1 million jobs," according to Agriculture Secretary Tom Vilsack. But all that productivity has taken a toll on the environment, especially rivers and lakes: Agriculture is the nation's leading cause of impaired water quality, according to the U.S. Environmental Protection Agency. Scientists want to get a better sense of how all that agricultural runoff is affecting water quality. So this summer, three dozen scientists from the EPA and U.S. Geological Survey are wading into some 100 streams, from Ohio to Nebraska. Their mission: Test for hundreds of pesticides and nutrients used in farming, and check for possible effects on what's living in the streams. 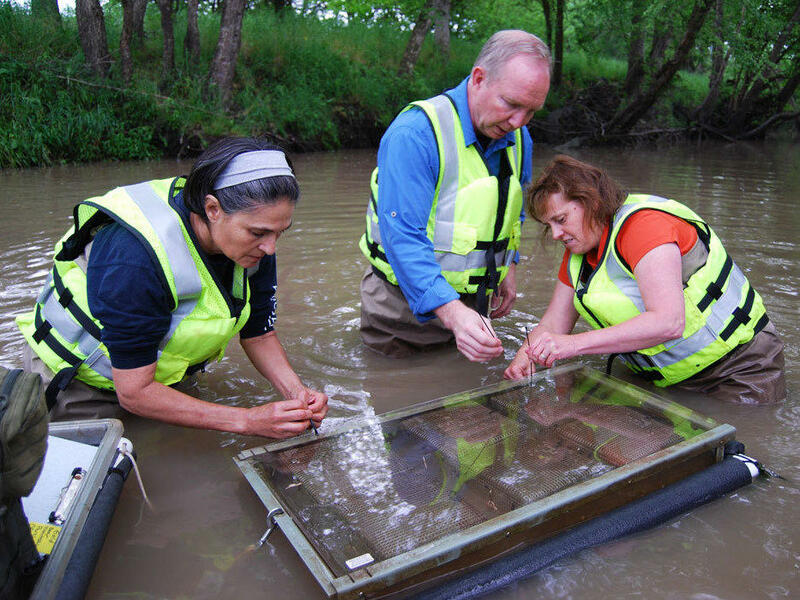 This is the first time scientists have tested for so many chemicals in a whole region's waters or considered the impact of agricultural runoff on fish, frogs, bugs and algae at this scale. The study is costing the USGS $6 million and the EPA $570,000. "These aren't the kinds of studies that are done routinely, because they are pretty difficult to do," says USGS biologist Diana Papoulias. "But we know that some of these chemicals that we're finding in the runoff from the ag fields can affect [aquatic] reproduction and egg production. Whether they are at the concentrations that can do that or not — we don't know yet." Some tests being conducted can measure even the tiniest amounts of mercury, livestock hormones and pesticides, including the weed killer glyphosate — better known by its trade name, Roundup. Farm runoff has become an even more pressing concern this year because of the Midwest's extremely wet spring. In between the frequent storms, farmers had only brief stretches of weather dry enough to apply pesticides and fertilizers. "Whether we want to blame it on climate change or just variability in the weather conditions, anytime you have these heavier rainfalls during the spring, after a drier period when you could have got something put in the field, you're going to see, in most cases, a large amount of runoff," says Bob Broz, a water quality specialist with the University of Missouri Extension. "It's been happening for years," he says. "The problem is now we seem to be seeing more of these more intense rainfalls. And that, in turn, creates a huge amount of nutrient loss." Nutrients like nitrogen and phosphorus are essential for growing crops, but they can also trigger algal growth in rivers, lakes and bays. Because last year's drought prevented some parched fields from absorbing fertilizers, an extra load of nutrients is flowing into Midwest waterways and will end up in the Gulf of Mexico. Once there, the chemicals can threaten aquatic life, says Bob Lerch, a USDA soil scientist. "There's the direct impact on the aquatic ecosystem," Lerch says. "And then there's the downstream impacts on say, drinking water, or a reservoir, or a recreational [body of water]." Agricultural runoff flows into the lakes and rivers that hundreds of towns draw their water from. For example, herbicide runoff from a farm in Centralia, Mo., might end up in Goodwater Creek, which empties into the Salt River, which then flows into Mark Twain Lake. That lake provides drinking water for 70,000 residents. Water treatment plants spend millions on chemicals to clean up that surface water. In northeast Missouri, for example, the Clarence Cannon Wholesale Water Commission treats 1.5 billion gallons of water each year. On a walk through the plant, Mark McNally, the commission's general manager, points out a massive, 900-pound bag of powdered activated carbon being funneled into untreated water. The powder is used to remove atrazine, a herbicide widely applied to cornfields in the spring. The chemical alone costs roughly $130,000 a year, McNally says. The plant passes that bill on to customers. "Aunt Agnes, you know, on Third Street, has to pay more for her water because we have to recoup our money," McNally says. "I mean, we're not in the business to make money. But we can't go broke." In Iowa's Raccoon and Des Moines rivers, record-high levels of nitrate runoff this year are making it extremely difficult to meet the demand for clean drinking water. The general manager of Des Moines Water Works, Bill Stowe, fears long-term effects. "Our concern, obviously, is that once you shake customers' faith in the safety of tap water, you turn them to other sources like bottled water, which is ... certainly a competitor," Stowe says. "It changes our business model and puts us at risk in the long term as a viable utility." Scientists say they'll have results from their Midwest stream study after the fieldwork is completed in August. Over the next several years, the U.S. Geological Survey plans to replicate the study in other regions. Abbie Fentress Swanson is a reporter for Harvest Public Media, a public radio reporting collaboration that focuses on agriculture and food production. And I'm Robert Siegel. Across the Midwest this summer, scientists are trying to assess the effects of agriculture on the nation's waterways. Some three dozen scientists are collecting water samples and counting fish eggs in about 100 streams. As Abbie Fentress Swanson reports from Missouri, they're looking for pesticides and nutrients used in farming. ABBIE FENTRESS SWANSON, BYLINE: Eleven miles northeast of Centralia, Missouri, chemist Dave Alvarez dons waders and a bright reflective life jacket before wading into Goodwater Creek. Plenty of fish live in these murky, slow-moving waters along with snakes, crayfish, mussels and snapping turtles. When the water reaches his waist, Alvarez dips a bottle attached to a long rod into the stream. DAVID ALVAREZ: So with this bottle here, we're collecting water samples, trying to catch any runoff that's coming down through for the pesticides. I just take this bottle. I dip it in the stream. I do it at equal distances across the creek. That way, I kind of get a mixture, a good representative sample of what's flowing through here. SWANSON: Alvarez is part of a team that's immersing itself in the ecology of streams from Ohio to Nebraska. It's an effort to understand just how agricultural runoff changes water quality. Years ago, scientists didn't test for much in the water, except for nutrients and heavy metals, but now they're able to measure even the tiniest amounts of mercury, pesticides and livestock hormones. Diana Papoulias is here checking cages of minnows for eggs. DIANA PAPOULIAS: We know that some of these chemicals that we're finding in the runoff from the ag fields can affect reproduction and egg production. Whether they are at the concentrations that can do that or not, we don't know yet. SWANSON: Farm runoff is an even more pressing concern because of the extremely wet spring here. Bob Broz is a water quality specialist at the University of Missouri and says narrow windows of dry weather meant that farmers had to apply pesticides and fertilizer in between storms. BOB BROZ: Anytime you have these heavier rainfalls during the spring, after a drier period when you could have got something put in the field, you're going to see, in most cases, a large amount of runoff. SWANSON: And because last year's drought prevented some parched fields from absorbing fertilizers, an extra load of nutrients is flowing into Midwest waterways and will end up in the Gulf of Mexico. U.S. Department of Agriculture soil scientist Bob Lerch says once there, they threaten aquatic life. BOB LERCH: There's the direct impact on the aquatic ecosystem and then there's the downstream impacts on, say, drinking water, or a reservoir, or a recreational water body. SWANSON: Agricultural runoff feeds into lakes and rivers that hundreds of towns draw their water from. For example, herbicide runoff from a farm in Centralia, Missouri, might end up in Goodwater Creek, which empties into the Salt River, which then flows into Mark Twain Lake. That lake provides drinking water for 70,000 residents. And water treatment plants spend millions on chemicals to clean up that water. MARK MCNALLY: That's 900 pounds of powdered activated carbon and that is basically metered into the water. SWANSON: At the plant he manages in northeast Missouri, Mark McNally points out a massive bag of fine black powder being funneled into untreated water. It's removing atrazine, an herbicide widely applied to cornfields in the spring. This powdered carbon alone costs about $130,000 a year, a bill the plant has to pass onto customers. MCNALLY: Aunt Agnes, you know, on 3rd Street, has to pay more for her water because we have to recoup our money. I mean, we're not in the business to make money. But we can't go broke. SWANSON: In Central Iowa rivers, record-high levels of nitrate runoff are making it more difficult to meet the demand for clean drinking water. Des Moines Water Works manager Bill Stowe fears long-term effects. BILL STOWE: Our concern, obviously, is that once you shake customers' faith in the safety of tap waters, you turn them to other sources like bottled water, which is certainly a competitor. It changes our business model and puts us at risk in the long term as a viable utility for providing drinking water for a half million people. SWANSON: Back at Goodwater Creek, scientists here say results from the Midwest stream study will trickle in after the fieldwork is complete in August. Over the next several years, they'll replicate the study in other regions to try to learn how farm runoff is affecting water quality across the country. For NPR News, I'm Abbie Fentress Swanson in Columbia, Missouri. SIEGEL: That story came to us from Harvest Public Media, a public radio reporting project that focuses on agriculture and food production. Transcript provided by NPR, Copyright NPR.